The issues in Christology post has raised a very important point regarding the natures of Christ in relation to His person. The phrase “communication of attributes” (in Latin, communicatio idiomatum) refers to the way in which we can say things about Christ’s person that more specifically relate to one of His natures. In other words, whatever we can say about Christ’s human nature, we can also say about His person. Whatever we can say about His divine nature, we can also say about His person. 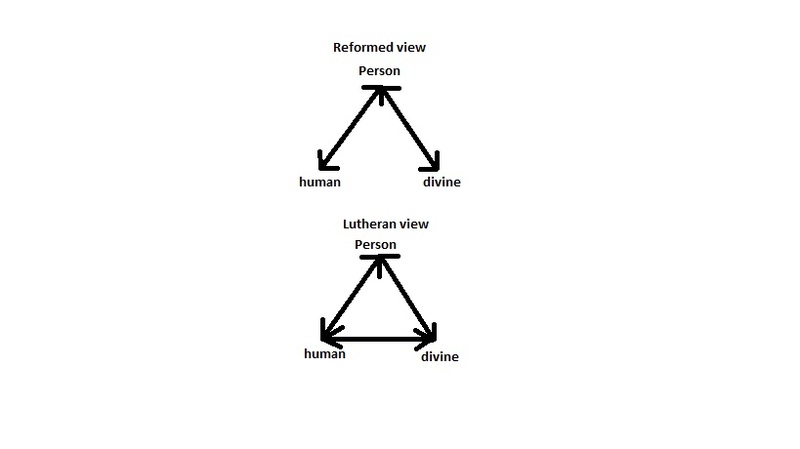 However, here is where a difference occurs between the Reformed and the Lutheran. The Lutherans believed in a different communication than the Reformed do. The Lutherans believed that what can be said about Jesus’ divine nature can also be said about His human nature. This is how they undergird their doctrine of consubstantiation. If the attributes of God can be communicated to Christ’s human nature, then there is no obstacle to saying that Christ is physically present here on earth in, around, through, and under the elements of bread and wine. The Reformed did not believe in this form of the communication of attributes. Instead, they believed that Christ’s human nature stayed human, and Christ’s divine nature stayed divine, and that those two natures did not communicate attributes to each other, but rather to the person of Christ. I have tried to draw a little graphic design that will help illustrate the point. The lines represent the natures of Christ, and the arrows represent the communication of attributes. Now, some who are calling themselves Reformed on this blog have been arguing for a Lutheran version of Christology. And these people have suggested that I have been undervaluing the hypostatic union of the divine and the human. As one can see from this diagram, however, the Reformed view of the communication of attributes draws one’s eye to the apex, which can be said to be the hypostatic union. So, on the contrary, the hypostatic union is what prevents us from attributing human characteristics (or suffering!) to the divine nature. The hypostatic union is precisely the point at which the inseparability and distinction of the two natures meets. It occurred to me recently that, although the Reformed tradition has been correct about the (S)piritual presence of Christ at the Lord’s supper, the orientation of that discussion has always (due to the debates) been (limitedly) the physical place on earth wherever the Lord’s Supper is being celebrated. There is an element of the Lord’s Supper that has sometimes been overlooked in all this, an element which the Reformed have always affirmed. It is called the sursum corda. It is the “lifting up of the hearts.” This element is common among all Christian traditions, incidentally. “Lift up your hearts…” “We lift them up to the Lord.” This does not mean “feel uplifted.” This actually means that, by faith, we are lifted up into the presence of God in heaven itself. If you look up Calvin’s liturgy for the Lord’s Supper, you will find it clearly present. At the Lord’s Supper, then, what we are saying by the sursum corda is that we are lifted up into the presence of Christ Himself, by faith. The implications of this for the Lord’s Supper now become clear. Christ is not physically present in the elements down here on earth. He is present “down here” only by the Holy Spirit. But He also lifts us up to Him there in heaven spiritually, by faith. So Christ is present physically at the Supper. The two qualifications are that He is not present in the elements, and He is not present down here except by the Spirit. Instead, He lifts us up by the Holy Spirit through our faith, so that we can be present THERE. My wife, when I had explained this idea to her, had one of those (many!) brilliant insightful moments, and added that this was eschatological: we are already present there at the Lord’s Supper in heaven by faith, and we will be present at the Wedding Supper of the Lamb in the future. So there is an already/not yet structure to this participation. I think I had known this about the Lord’s Supper in general. However, I had not applied it specifically to being in the physical presence of Christ by faith already, and waiting for our physical presence to be before His physical presence not yet. I have not seen this particular idea anywhere, although I guess I would be surprised if no one has ever thought of it before. I myself came to it as I was contemplating the last Christological post I had written here. If anyone knows of anyone who has thought this thought before, I would be grateful if it could be pointed out. This volume. The first volume, Köstenberger on John, was a real masterpiece, done by the evangelical world’s best expert on John. Similarly, this volume on Luke-Acts is being done by the evangelical world’s foremost expert on the Lucan material. The only thing that gives me concern is the length. Less than 500 pages to deal with the theology of Luke AND Acts? We shall see. I was reading yesterday in my Shorter Catechism commentaries in preparation for Sunday, when I came across a rather old issue in Christology. What relationship does Christ’s divinity have to the suffering of Christ? Some background on the question is necessary. We believe that Jesus has a full divine nature, and a full human nature (both body and soul), but united in (only) one person. The Reformed have believed (over against the Lutherans) that the properties of the human nature may be ascribed to the whole person, and that the properties of the divine nature may be ascribed to the person, but that the properties of the human nature may NOT be ascribed to the divine nature, or vice versa. In the Lord’s Supper, for instance, the Lutherans believe that Christ’s human nature is omnipresent in the Supper, whereas the Reformed believe that the human nature of Christ is seated at the right hand of the Father, and that Christ is rather present by the Holy Spirit (this is the so-called extra Calvinisticum, the “extra” ability that Christ’s divine nature has to be everywhere present over and above the limited physical presence of His human nature). Sometimes Jesus does or says something according to one nature, and sometimes according to the other nature. So, when it comes to the suffering on the cross, what exactly was happening? Did God suffer on the cross? This is a common question asked to candidates for licensure and ordination. I believe that the answer is that His divine nature sustained His human nature, but did not itself suffer. This sustaining would not be limited to the physical suffering, but would also include the spiritual suffering, as well as the sin-bearing. This is not a communication of properties of the divine to the human, since God also sustains us without communicating Godness to us. The divine nature was therefore active in the suffering, but not as the direct recipient of the suffering. What do ya’ll think? I saw the lectures that form the basis of this book, and so, though I haven’t read the book yet, I can recommend it. One of the biggest problems facing people who are contemplating getting married is the problem of expectations. We usually expect more from the potential spouse, and less of ourselves. Furthermore, we expect our future spouse to feed our own idolatries. Then, when they do not, we turn on them. Paul addresses these problems and others, advocating a reconciliation mindset full of God’s grace. The phenomena of The Hunger Games, a trilogy of teen novels, written by Suzanne Collins, is worth a comment or two. I read the books, having heard about them from a nephew of mine. I decided to read them to see what it was all about. It is difficult to describe my reaction to these books. I would imagine that one’s reaction would vary, depending on one’s station in life. For a teenager, the appeal would simply be rooting for an underdog facing unbelievable challenges. For an adult with children, the horror of violence-as-entertainment comes to the fore. Collins is definitely deconstructing our violence-saturated culture. She does so through three rather violent books. However, as we all know, violence can be depicted in different ways. In these volumes, the horror of violence is front and center. I must issue a warning at this point to any parents of teenagers: if you are at all prone to nightmares about your teens, do not read these books. It will certainly give you nightmares. I am not prone to nightmares at all (I rarely dream at all, actually, at least not so that I could remember what I dream), and I could not sleep the first night I read these. Collins is a superb writer. These are page turners. Whether you would read them or not, I would say that these books could have a very beneficial effect on our culture. If any are discouraged from glorying in violence, she will have more than enough compensation for her labors. If any teenagers are discouraged from becoming violent, again a noble purpose is served. The only critique that I would offer is that she has no real basis for avoiding violence. They are not Christian novels in any obvious way. I could not even detect hints or Christian symbolism. So she offers us no “why” as to avoiding violence. What she does do is depict violence is such horrific colors that you feel like you never want to “enjoy” a violent movie again (at least, not a movie that glories in violence). And some passages will move you to tears, especially the scenes concerning Rue. Rue is a 12 year old girl, forced to participate in the hunger games. She is the embodiment of innocence. She is precisely the person who should not be victimized by a system that glories in violence, and yet so often, the Rue’s of this world are precisely those that get victimized in just such a fashion. Read and weep. But, as Christians, our anger should be focused on the cause of this kind of violence, and on the solution. Sin is what causes violence, and the Gospel of Jesus Christ is the only solution. To all my readers, since 2K theology and related subjects seems to bring out the most viciously childish side of the commenters (WAY worse than any Federal Vision posts! ), I propose to cease my review of Frame’s book. To tell you all the truth, I am embarrassed by it all. What should have been a substantive in-house debate and discussion turned into a mere screaming match. I suspect that those with substantive points to make were driven off by the mudslinging going on. And no, I will not allow comments on this post, because that will only result in more finger-pointing. It will be a very long time indeed before I allow any more 2K discussion on this blog. Tolle Lege Press is now coming out with something that should push them into the mainstream of Reformed publishers. The first volume will be coming soon. This series aims to be a non-technical, but still substantive commentary on the New Testament, aimed at helping preaching, and aimed specifically at promoting expository, lectio continua preaching from a confessionally Reformed perspective. Yours truly is helping to edit this series. The main editor is Jon Payne, who graciously pulled me off the Galatians project, as I was right in the middle of moving to South Carolina. Lord-willing, I will be able to help with the John volume, currently being written by Terry Johnson. Other contributors include Derek Thomas, Jon Payne, Danny Hyde, Kim Riddlebarger, Joel Beeke, Sinclair Ferguson, Harry Reeder, Iain Campbell, and David Hall. ‘Nuff said! The noetic effects of sin describes the result of sin on the mind. Atheists, for instance, know that God exists. They just can’t stand the God they know. Now, the mind still has a degree of logic to it. A pagan can still add 2+2 and get 4. However, they will always start from a false premise when it comes to the existence of God. By nature, we will not love God. God has to change the disposition of our hearts by the Holy Spirit’s work of regeneration. Regeneration is a necessary condition for loving God with our mind. People are not truly seeking God. They want the benefits of God without Him. They want the things that only God can give, while all the while, they are running completely pell-mell the other way. So, how does one love God with our minds? Nothing can be in the heart that is not first in the mind. We can’t love what we can’t know. So, the idea that we can worship God by entertainment, by-passing the mind to appeal directly to the emotions is a fool’s errand. The text is 1 Corinthians 1:18ff. Greek philosophy was very much a going concern. It came to Corinth from Athens. there were many differing philosophies on offer in the first century. The gospel Paul preached was in direct conflict with all the philosophies of the day. It was regarded as foolish. Furthermore, the messengers were also considered foolish. It is also a foolish method. In these three ways, Paul’s message is foolish to the Greeks. The message was regarded as foolish. We are not just dogmatic about the cross: we are bulldogmatic about the cross! But it is nonsense to those who are perishing. Notice the present tense: they are currently dying from the inside out. We preach what seems like a contradiction: a crucified Christ. That’s like saying “freezer burn.” Or “Central Intelligence Agency” (LK) We preach a crucified conqueror, a slaughtered savior. This is foolishness to the world. But it is the only way. Why? Because God will have all the glory for Himself. We should therefore never try to make the foolishness of the cross appear to be brilliant to the world. The messengers were also regarded as foolish. In verse 26 he shifts to the messenger, although this is not a shift of main subject. He is still plumbing the depths of why the world considers the message foolish. It is nott only because they think the message is foolish, but they also reject the messengers. God wanted to make sure that it was not because we were to have faith in the messenger. So God chose the foolish ones of the earth. Notice that God’s choice stands behind and before the calling. This is so encouraging, though. How could God use us? We didn’t make Who’s Who? We didn’t even make Who’s Not. God intentionally reached down to the bottom of the barrel. The only possible explanation left is that there has to be a God. We are all nobodies telling everybody about Somebody. If someone is intellectually elite, God will have to work quite a bit harder. Lastly, the method God chooses is also regarded as foolish (chapter 2:1ff. “Lofty speech” refers to the style, and “wisdom” refers to the substance. We cannot come at this by saying that the method never changes the substance. Paul says that the method is important. It has be a cross-centered method. It has to be a straight-forward approach. This is in contrast to all the rhetoric that was so much loved in Athens and Corinth. Preaching is foolishness to the world. Everyone who tries to change the method God has established is trying to rely on man’s wisdom. Hence the vital importance of preaching in the church today.